This Lithium Super B battery SB10P contains hight capacity and lightweight, (only 3.86 lb / 1.6 kg kilogram, upto 80% weight reduction). The Super B accu SB12V10P-DC has a longlife cycle and low self discharge. The battery is specially developed for Harley Davidson, custom built motorcycles and Racing cars up to 2000 cc using alternator. Other race cars w/o alternator up to 1600cc, other race cars with alternator up to 2000cc. This newly developed battery is designed to replace the much heavier 20 to 35 Ah lead/acid battery. 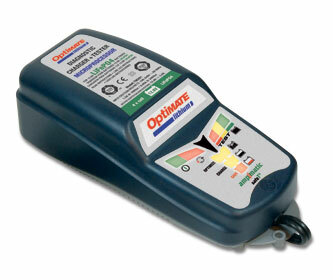 The super B 10P is based on the safe Lithium Iron Phosphate technology (LiFePO4), better known as Lithium Ion. The super B 10P delivers up to 600 Cranking Amps. *has a low self-discharge rate. super B batteries are based on Lithium Iron Phosphate technology (LiFePO4). This so called Lithium Ion technology as used in the super B batteries is the safest Lithium Ion technology today. On top of that our specially designed casing and electronics further increase safety and durability. super B 10P refers to 10 Ah (Amps/Hour), which represents the real nominal capacity under maximum continuous load. How different this is from lead / acid batteries where manufactures provide a 20 hour rating. For example the 10 Ah lead / acid batterie can be discharged over a period of 20 hours with a 0.5 Amp load. This is not very practical, as the same 10 Ah battery discharged with a 2.5 Amp load, for example a 25 Watt light bulb, will yield no more than 2.2 Ah of energy. The lead-acid battery, therefore, has less capacity when the load increases, which means that you can start more often with the super B. 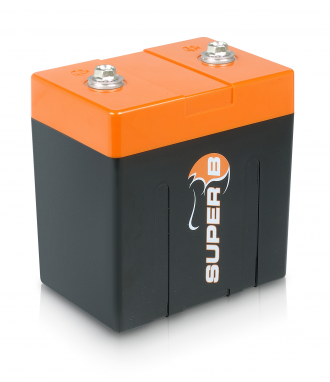 We use a 10-second rating instead of CCA for the super B 10P battery. The 10-second rating is easy to understand: it represents the amount of current a battery can produce during 10 seconds without being damaged. The super B 10P can deliver a current of 600 Amps during 10 seconds. 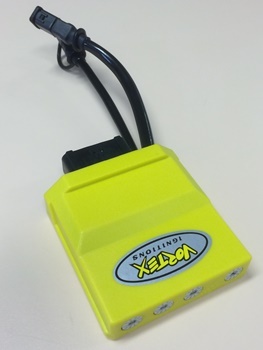 The batteries can deliver higher currents for shorter periods and lower currents for longer periods. 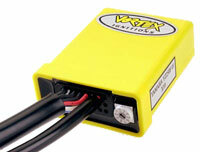 The super B 10P battery can be charged with almost all motorbikes, up to a maximum of 14.4 Volts. Do not overcharge, as this will damage the battery. The super B charges much faster than conventional batteries: charging a lead- acid battery takes 7 to 14 hours, during which the internal resistance increases and the charge current decreases. The super B 10P can be charged within 1 hour at a charge current of 12 Amps. If the charge current is increased to 24 Amps, it will charge in 30 minutes. Do not charge the battery with more than 40 Amps as this will damage the battery. We recommend to use the appropriate super B charger to charge super B batteries. Do not use a lead-acid charger, as these chargers are optimized for a different battery technology and make use of methods for charging and safeguarding which are unsuitable for super B batteries. As super B batteries have a very low self-discharge rate, the batteries will last for several years in storage. The Battery may be replaced. If replaced, its nominal capacity must be equal to or higher than the Homologated type. The F.I.M. has approved the super B battery for use as replacement battery.